Someone forgot to remind the U.S. Mint of Lance’s axiom. 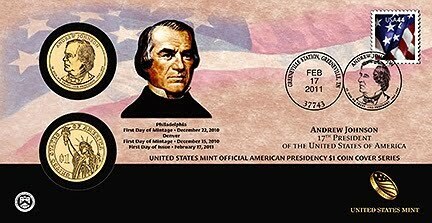 Last month, the U.S. Mint announced the availability of the availability of 2011 Andrew Johnson $1. I am a fan of the coin covers. I have the covers from the 50 State Quarters, D.C. & Territories, Westward Journey Nickels, and the 2000 Sacagawea Dollar covers. I also own the four covers produced by the U.S. Mint produced in the years leading to the American Revolution Bicentennial. However, I was reminded of Bert Lance when I saw the new cover. 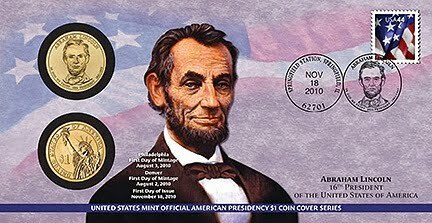 Starting in 2007, the covers had a large image of the president being honored with the president’s name, term, and a postmarked current stamp. On the reverse is a short blurb about the president. Embedded in the cover are two uncirculated coins, one from Philadelphia and the other from Denver, from the first day the coins were struck. It is the only way to know on which date the coins were struck. The entire cover was beautiful in its simplicity. In trying to deal with its new branding, the U.S. Mint altered the cover that reduced the cover and added a black bar across the bottom of the cover. The black bar is empty except for a small version of the official U.S. Mint logo on the left and the new branding logo on the right. As a result, the portrait of the president is made smaller. The space taken up by that garish black bar causes the rest of the cover to look cluttered. Rather than trying to find a more subtle way to add their branding to the cover, like on the reverse without the tacky black bar, the U.S. Mint broke one of their better presentations. After this debacle, maybe the CCAC Blueprint Report should have added packaging design to the list of functions that should be reviewed!